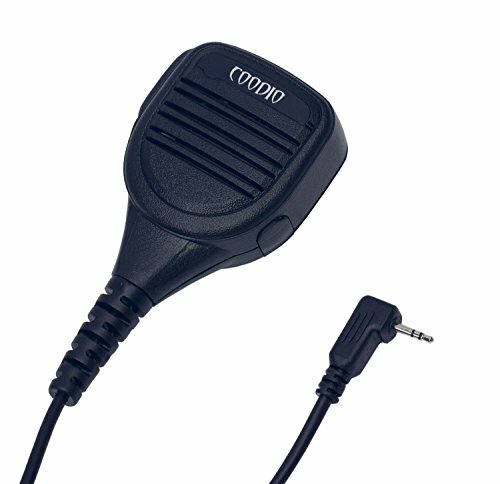 Coodio's 1 pin Motorola Talkabout two way radio heavy duty IP54 waterproof remote lapel microphone speaker mic simplifies jobs by allowing users to talk and listen without having to remove their radios from belts or carrying cases. This Remote Microphone conveniently with an IP54 water rating conveniently clips to your shirt pocket or lapel and enables easy communication, a large housing makes it easier to operate while wearing gloves in a more rugged environment. Includes Push-to-talk switch, coiled cord, swivel clip and 3.5mm audio jack available to attach listen only earpiece for discreet communications. ONLY compatible with 1-Pin Motorola Talkabout walkie talkies two way radios including Motorola Talkabout T200, T260, T400, T460, T465, T480, T600 H20, T605 H20, MU350R, MU354R, MS350R, MS355R, MT350R, MT352R, MT352TPR, MR350R, MR350TPR, MR355R, MJ270R, MH230R, MH230TPR, MD200R, MD200TPR, MD207R, FV300, T9680RSAME.